Beginning at about age 40, hormonal changes cause the number of cells in a man’s prostate to increase causing the prostate to grow and constrict the urine tube that runs through its center. An enlarged prostate, also known as benign prostatic hyperplasia or BPH, is not cancerous, but over time it can cause bothersome urinary symptoms. The symptoms of an enlarged prostate may be mild or come and go, and as a result, most men wait several months, even years, before seeing a doctor. In general, waiting to see a physician does not pose a problem. A man’s feelings about his symptoms are a major factor in determining the most appropriate treatment. If the man is extremely unhappy with his symptoms, he may elect a more aggressive, immediate form of therapy. If he is only mildly bothered but still wishes to pursue treatment, he may elect to use medications. Take the BPH Symptom Quiz to help understand the severity of your symptoms. To quantify the effect of urinary symptoms on a man’s quality of life, urologists use a symptom questionnaire developed by the American Urological Association. The higher the score on the questionnaire, the more likely the patient needs aggressive treatment. A man being evaluated for enlarged prostate will also receive a rectal exam and a have his blood drawn to measure his body’s prostate specific antigen (PSA). These steps verify whether the symptoms are the result of an enlarged prostate or could be caused by a prostate infection or prostate cancer. Treatment is available when the symptoms an enlarged prostate are affecting your quality of life or are so severe that they put you at risk for serious complications like urinary tract infections or bladder or kidney damage. New! UroLift: Minimally invasive approach that lifts or holds the enlarged prostate tissue out of the way so it no longer blocks the urethra. New! Rezūm: Minimally invasive water-vapor therapy that shrinks the prostate without the need for medications or invasive surgery. Medications: There are two types of medications. Your doctor may prescribe one or both. Alpha Blockers relax the prostate muscles and bladder neck to improve urine flow. These medications start working almost immediately. 5-Alpha-Reductace Inhibitors block the hormone that causes your prostate to grow. They help relieve symptoms by shrinking your prostate over time. Nonsurgical Procedures: These include treatments that use heat to destroy extra prostate tissue. They shrink your prostate and help open up your urethra. 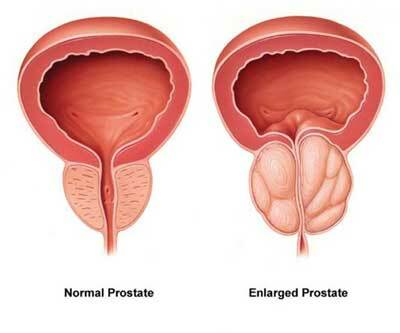 Surgical Procedures: These treatments remove the enlarged part of your prostate to make it smaller. The most common surgery to treat surgery is called a transurethral resection of the prostate (TURP) in which the urologist removes the excess tissue surrounding your urethra with a traditional surgical instrument or a laser. Metabolic Syndrome has also been linked to BPH. Do herbal supplements advertised for enlarged prostate symptoms work? There is no herbal supplement proven to improve symptoms of an enlarged prostate. Specifically saw palmetto, one of the more popular supplements used by men, has been shown to provide no benefit over a placebo. Does an enlarged prostate improve without treatment? Early on, enlarged prostate symptoms may come and go, so taking a “wait and see” approach to mild symptoms is reasonable. Over the long-term, however, symptoms tend to get gradually worse.